Career Advice article “The opportunities for the learning that take place in down cycles, for people who are early in their career, now is the time to raise your hand and say, ‘Give me the biggest pile of crap that you have,’” van Kempen said. As a geologist from the 1970s – 1990s until I capitulated and went into a different line from the exploration business, I would have laughed at the statement above if it hadn’t been so painful to remember how bad it was and how bad it will be for thousands of engineers and geologists as well as oil field workers who will not survive this downturn. I anticipate the downturn to last no less than 10 years. Let me tell you what is really going to happen. A lot of geoscientists are going to go into the environmental field, teaching, civil engineering, government-regulatory field, or, leave the field entirely. 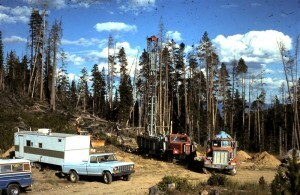 In the 1980s I had friends who went to work for the Corp. of Engineers, ran a home for orphans, taught school, worked as a cave bat researcher, technical sales, worked cattle in a stock yard, entered state government jobs, worked for a small engineer soil testing firm, archived records for oil companies that later were bought out (ARCO), and I know three who became appraisers like myself. Engineers did only slightly better. Even exploitation engineers in the field were laid off and mergers and acquisitions caught others off-guard. One of my best friends was an AMOCO engineer who became the computer guru of a cookie plant, later was the night shift manager. I meet dozens of people who say they worked in the oil fields in the 1970-80s boom, and have never returned and will never return even if given an opportunity. I was in a café in Bentonville, AR where I was a picture of a rig. The manageress said it was one taken by her husband. I met him later and he had lost a finger…loading a glass plate at the Walmart Warehouse where he worked. He wanted to go back then (mid-90s) but there were no opportunities for his specialty. The ones who remain will see shorter pay, endure difficult jobs, and only a few of them would not be better off changing careers NOW. I certainly would have. In 1987 my net taxable was a minus $10,000. Just as my business was returning to semi-normal, the Kuwait War collapsed prices once again. I finally gave up and re-trained as an appraiser. I should have done it at least 6 or 7 years earlier. Trying to weather the storm until things got better only decimated my entire savings and I lived in my garage for 8 years until I could afford to build a house. I was debt free in 1986 and have never been out of debt since. The few players I know who survived the 1980s-90s were mostly consulting or running a small company. I can think of only a few that actually had salaried positions. None were being given any big raises or bonuses and most live in modest houses and drive non-luxury cars. My advice to anyone who finds themselves out of work in this downturn should consider a radical career change and never look back. The idea that you will gut it out and somehow it is a “good time to hone your career” is ludicrous. For 3 out of 5 geologists and engineers, they have reached their apex and need to switch careers. Of the others, most can expect a future where they muddle thorough with only the exceptionally good or lucky continuing a productive and lucrative career in the energy business. The rest are survivors merely, and the business for the moment is as Monty Python might put it, “This bird is dead.” And Mssr. van Kempen is singing to the Choir Invisible.